Welcome into this week's edition of BCG Pix, our regular Billy Casper Digital Network feature where we feature some of the best photography you've shot of our facilities from around the country. Sure, it's a little chilly in Aurora, Ill. (actually, it's a nice 47 degrees today, albeit windy), but that doesn't mean we can't appreciate one of the best holes in the area. 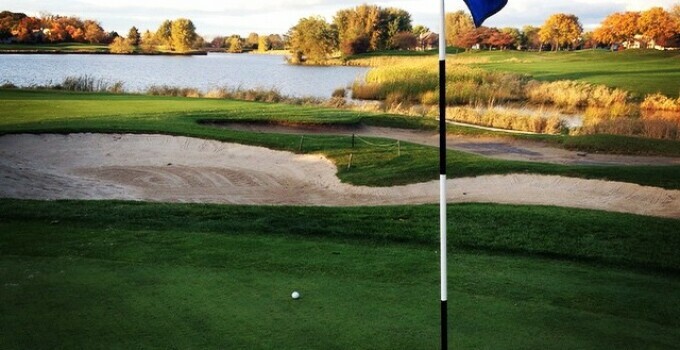 Orchard Valley Golf Course is one of Chicagoland's best public golf courses, designed by Ken Kavanaugh, and has been given a four-and-a-half-star rating by Golf Digest. The par-4 15th hole is one of the shorter 4s on the course, playing just 343 yards from the tips on a 6,800-yard course. However, with water guarding the entire right side and a stream rejecting any approach shots that come up well short with a wedge, it's no surefire par. Pavtastic shared on Instagram a great picture of a great approach, looking back on the 15th hole. Enjoy!